Astronomers for the first time have detected repeating short bursts of radio waves from an enigmatic source that is likely located well beyond the edge of our Milky Way galaxy. The findings indicate that these “fast radio bursts” come from an extremely powerful object which occasionally produces multiple bursts in under a minute. Prior to this discovery, reported in Nature, all previously detected fast radio bursts (FRBs) have appeared to be one-off events. Because of that, most theories about the origin of these mysterious pulses have involved cataclysmic incidents that destroy their source – a star exploding in a supernova, for example, or a neutron star collapsing into a black hole. The new finding, however, shows that at least some FRBs have other origins. That changed last November 5th, when McGill University PhD student Paul Scholz was sifting through results from observations performed with the Arecibo radio telescope in Puerto Rico – the world’s largest radio telescope. The new data, gathered in May and June and run through a supercomputer at the McGill High Performance Computing Centre, showed several bursts with properties consistent with those of an FRB detected in 2012. The repeat signals were surprising – and “very exciting,” Scholz says. “I knew immediately that the discovery would be extremely important in the study of FRBs.” As his office mates gathered around his computer screen, Scholz pored over the remaining output from specialized software used to search for pulsars and radio bursts. He found that there were a total of 10 new bursts. The finding suggests that these bursts must have come from a very exotic object, such as a rotating neutron star having unprecedented power that enables the emission of extremely bright pulses, the researchers say. It is also possible that the finding represents the first discovery of a sub-class of the cosmic fast-radio-burst population. “Not only did these bursts repeat, but their brightness and spectra also differ from those of other FRBs,” notes Laura Spitler, first author of the new paper and a postdoctoral researcher at the Max Planck Institute for Radio Astronomy in Bonn, Germany. Scientists believe that these and other radio bursts originate from distant galaxies, based on the measurement of an effect known as plasma dispersion. Pulses that travel through the cosmos are distinguished from man-made interference by the influence of interstellar electrons, which cause radio waves to travel more slowly at lower radio frequencies. The 10 newly discovered bursts, like the one detected in 2012, have three times the maximum dispersion measure that would be expected from a source within the Milky Way. 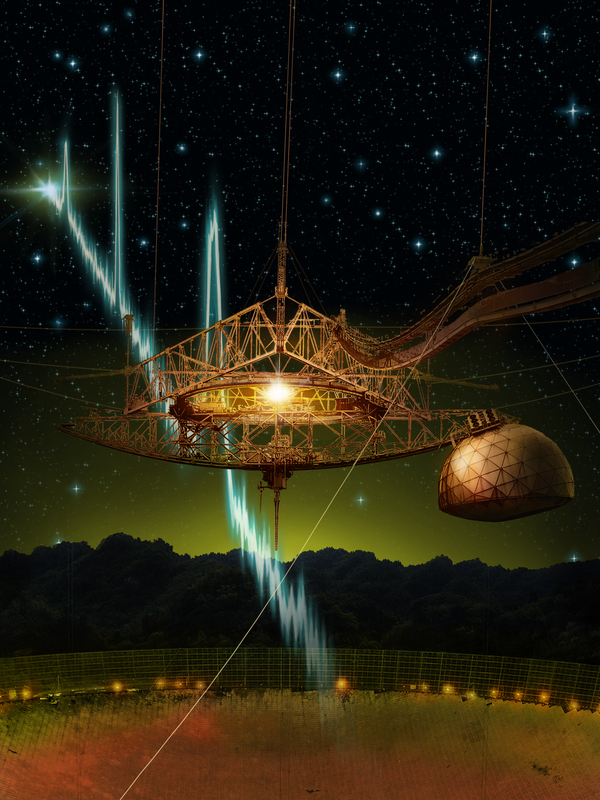 Intriguingly, the most likely implication of the new Arecibo finding – that the repeating FRB originates from a very young extragalactic neutron star – is at odds with the results of a study published last week in Nature by another research team. That paper suggested FRBs are related to cataclysmic events, such as short gamma-ray bursts, which can not generate repeat events. 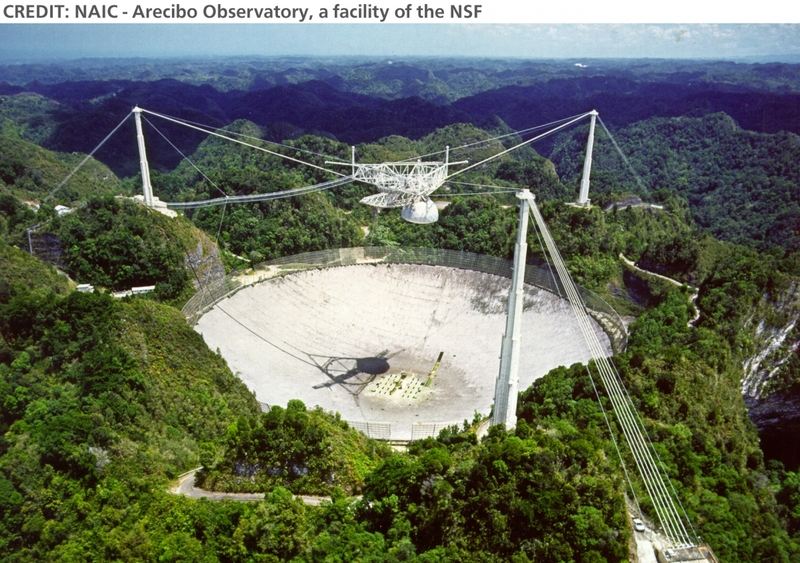 “However, the apparent conflict between the studies could be resolved, if it turns out that there are at least two kinds of FRB sources”, notes McGill physics professor Victoria Kaspi, a senior member of the international team that conducted the Arecibo study. In future research, the team hopes to identify the galaxy where the radio bursts originated. To do so, they will need to detect bursts using radio telescopes with far more resolving power than Arecibo, a National Science Foundation-sponsored facility with a dish that spans 305 metres and covers about 20 acres. Using a technique called interferometry, performed with radio telescope arrays spread over large geographical distances, the astronomers may be able to achieve the needed resolution. The McGill researchers were supported by the Natural Sciences and Engineering Research Council of Canada, the Canadian Institute for Advanced Research, the Canada Research Chairs program, the Lorne Trottier Chair in Astrophysics & Cosmology and the Fonds de recherche du Québec – Nature et technologies.